…Let me tell you a story. A CAD patient went to his doctor and asked, “What is cholesterol?” The doctor responded, “Oh! No problem, here’s a tear sheet from the American Heart Association.” The man didn’t understand it. He thought, “My father has CAD, too. He has a different doctor.” So he asked his father to ask his doctor the same question. The father went to his clinic. He asked his doctor, “What is cholesterol?” The doctor said, “Oh! No problem. Here you go,” and tore off the same tear sheet for the father. But let’s keep going and work hard at understanding. The handout has a picture. What is this picture? What is the title? There is no title. If you don’t know what cholesterol is, you are not going to know what this picture is. But let’s keep working. The picture has some circles and some ovals. What is this big circle and what are these little ovals? There’s nothing here to tell me. There are no labels on the components. Well, at least there’s a sentence down underneath the picture. What does it say? “Cholesterol travels through the blood by way of lipoprotein.” What does that mean? Not long ago, I went to Richmond by way of Atlanta. Is “lipoprotein” a place? In terms of the Juran Quality Institute, this handout from the American Heart Association is not fit for use. I have a friend who is an investment banker. He says, “In all my years investing in start-up ventures, I’ve learned one thing for sure: never let the engineers write the user instructions.” Unfortunately, there’s a parallel dictum: never let the clinicians write the patient instructions. 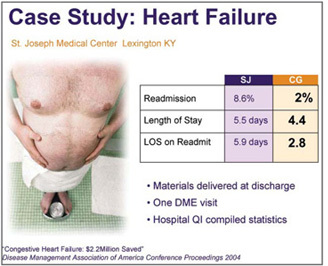 St. Joseph Medical Center in Lexington KY wanted to do something about this problem for heart failure patients, who need to know about cholesterol. They hired ethnographers who had redesigned a whole set of materials according to ethnographic research and other principles of qualitative research and evidence-based design. 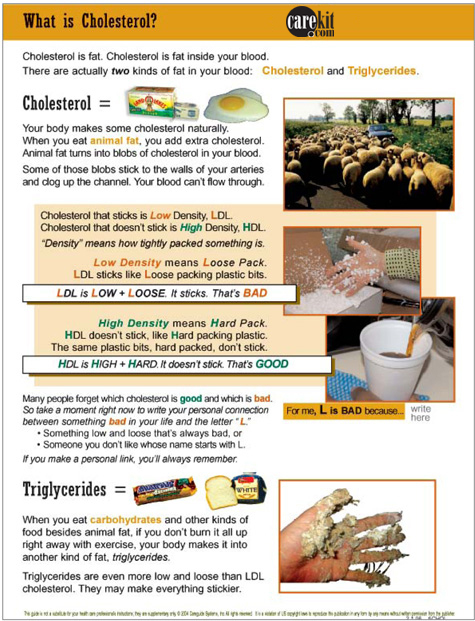 Here is the redesigned handout on cholesterol. and not sticky when tightly compressed. We beat our heads on this until we came up with styrofoam. When it’s in loose little pieces, it sticks to your hands, to shipping cartons, to anything it touches. But when you compress styrofoam and make it hard, you can make all kinds of things out of it that don’t stick, like a coffee cup. Now we have an image that a person can remember and work with. You can teach effectively with it, or the person may be able to learn by extending the metaphor themselves. Why is hard-packed cholesterol good? If you take a piece of hard styrofoam, and draw it through a pile of loose styrofoam bits, the bits will stick. You can draw them right out. That’s why hard cholesterol is good; it draws out loose, sticky cholesterol. When it comes to remembering that LDL is bad and HDL is good, even clinicians can have a little trouble sometimes. So what this material does is take a leson from industry. Consumer products experts know how to make you remember. There is, in a recent film, a sad but hilarious sidewalk interview where everyone walking by the White House can sing the Big Mac song, but none of them knows any of the Bill of Rights. As health care providers, let’s take the techniques of consumerproducts advertising and make these health care information points memorable, as intrinsically memorable as the Big Mac jingle. Shock. Humor. And I guarantee you will never forget it again. All of this may be entertaining, but it would have no value if it didn’t make a difference in patient outcomes. What happened in Lexington, Kentucky? 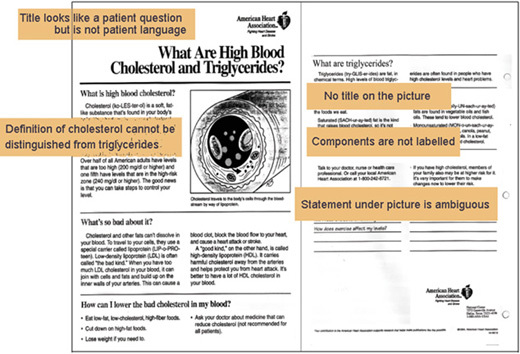 This cholesterol handout was one of a set that were redesigned in similar ways for a heart failure program. The hospital measured readmission, length of stay, and length of stay on readmission. The materials that were redesigned were delivered at discharge. A DME person, familiar with the handouts, came to the house and evaluated patients’ oxygen needs, but no other follow up was provided. The hospital quality department collected the statistics. St. Joseph was already doing well with their outcomes before they started this program. Their readmission rate for heart failure was 8.6%, which was about half the national average at the time. They were one day over the Medicare limit on length of stay. For those that were readmitted, the second stay was almost 6 days of unreimbursed costs. Each month of using the materials, the readmission rate dropped steadily till it reached 2%. The initial LOS went to 4.4 days. The readmission LOS shrank by half, to 2.8 days. In discussions of compliance, providers seldom discuss the quality of their handouts, but often blame patients for being resistant. Interventions like St.Joseph’s suggest that if we give patients materials they can understand, the majority will spontaneously comply. Patients are not resistant; they have received materials that are not fit for use. 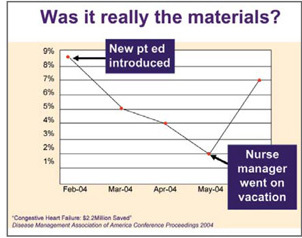 Sometimes people ask if St.Joseph’s outcomes were really because of the materials. The hospital staff were doing other things, after all. When we examine the time line of the project, we see that the rate of readmission was dropping month by month after beginning the materials distribution. Then in June they shot back up again. What happened? Only one case manager had been responsible for passing out the materials. He went on vacation. No one passed out the materials. After the materials were reinstated, the rate of readmission dropped again and remained around 4% for the remainder of the year. A true breakthrough. We don’t realize the magnitude of patients misunderstand what we write for them. 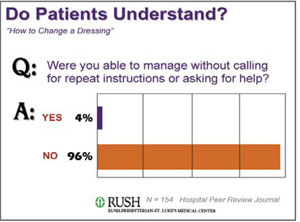 Rush Medical Center in Chicago decided to measure whether patients understood their post surgical instructions for changing a dressing. For three months, they followed their normal procedure of distributing gauze and tape to patients after abdominal and orthopedic surgery. They also gave away instructions the nurses had written that were approved by the Patient Education Committee. One week after discharge, they called the patients and asked, “Were you able to manage without calling for repeat instructions or asking anyone for help?” They were astute enough not to ask, “Did you understand?” because everyone will say yes. That’s a focus-group kind of question. But number who answered yes was only 4%. A full 96% could not change the dressing independently. Even if you take out the limited literacy population, that leaves 63% who could read and still couldn’t follow the instructions. In no other industry would it be tolerable to have 96% failure rate. In health care, we’re not even measuring whether our patient education products work. We write them, we get non-functional approvals, and we don’t realize that when the product reaches the context of use, it does not function. Whether we apply the Juran principles to patient education, to CMS pay-for-performance areas or to other quality improvement projects, the Juran Quality Improvement Cycle will earn our case management departments breakthrough ROI. First, find the projects that are the Vital Few by checking if you can measure outcomes, not merely process improvements. Next, get a baseline on today’s performance. Then conduct qualitative research to learn what the functional requirements are for use in context. From those findings, design an intervention. If measure outcomes, we have maximum freedom to consider all types of innovations. Make sure the intervention passes all non-functional requirements. Finally, measure the impact on outcomes—you can expect at least a 15% improvement Now begin the cycle again for another breakthrough. If quality is fitness for use in the context of the end user, then we have no tradeoffs between ROI and patient-centered care. We can achieve breakthough in both.